Over the past quarter of a century, Russian cuisine has been enriched by new dishes that have arrived from abroad. However, it turns out that their foreign names often cover notions that existed in Russia's Soviet period too. The fall of the Iron Curtain and the rapid market economic reforms of the 1990s brought about considerable changes to the Russian menu. The new restaurants and cafes that sprang up tried to attract customers by offering something new and exotic. Although McDonald's hardly qualifies for being described as exotic, it signaled the arrival in Russia of Western catering standards. When it first opened in the late 1980s, Moscow's first McDonald's had enormous linesof people outside. People took a visit to a McDonald's as if they were dining out in an upmarket restaurant and spent hours waiting in linejust for the sake of tasting a hamburger (gamburger, гамбургер), which was a great novelty at the time. Having ordered a Coca-Cola with ice, they would often eat the ice too, as it had been paid for. These days, numerous McDonald's outlets - informally called makdaki (макдаки) - are no longer treated as restaurants but rather as what was known in Soviet times as a zabegalovka, a place where you could have a quick meal and which is now described as fast food (fastfud, фастфуд). Another popular type of fast food that came to Russia from the West washotdogs (Russian dictionaries first recorded the new word khotdog (хотдог) in 2001). Another popular type of food is pizza, which is either served at pizzerias or delivered to your home. Street kiosks also sell various sandwiches (sendvichy, сэндвичи), including long baguette sandwiches. The latest Moscow fast food discovery are meatballs (mitboly, митболы). On weekdays, many restaurants and cafes offer business lunches, usually consisting of four courses. Back in Soviet times, a similar concept was known as a set lunch (kompleksny obyed, комплексный обед). Meanwhile,popcorn (popcorn, попкорн) at cinema theaters first arrived in Russia only in post-Soviet times. As for chips (chipsy, чипсы), which these days are available in all sorts of flavors, in Soviet times they existed only in one plain variety, and the brand (Khrustyashchiy Kartofel) survives still, capitalizing on the nostalgia factor. The Soviet version of ketchup (ketchup, кетчуп) was called simply tomato sauce. The word pasta (pasta, паста) entered the Russian language relatively recently. Previously, people would use the words spaghetti (spaghetti, спагетти) or - back in Soviet times - macaroni (makaroni, макароны). For example, a popular Soviet dish somewhat similar to spaghetti bolognese was known as "макароны по-флотски" (macaroni navy-style). The words "лазанья" (lasagna) or "паэлья" (paella) are present on the Russian culinary market too, although not very prominently, the same as the word "равиоли" (ravioli), which are considered to be a variety of the traditional pelmeni. 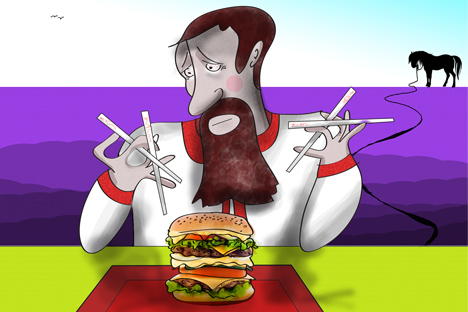 Japanese food is incredibly popular in Russia: they say Russians eat more sushi and maki rolls than people in Japan do. There also many fusion (fyuzhn, фьюжн) restaurants. Some restaurants take fusion to mean a combination of seemingly incompatible dishes, like pizza, maki rolls and borsch. The words yogurt, croissant and muesli (iogurt, йогурт";kruassan, круассан;myusli, мюсли) arrived in Russia, together with the food they denote, only in the post-Soviet period. Interestingly, the word ‘yogurt’ (just likethe product itself) existed in the Russian language over 100 years ago, but then became obsolete. Originally it was borrowed from French and therefore was pronounced with the stress on the second syllable. However, the second time around, in the 1990s, it came from English with the stress on the first syllable. This duality caused a recent scandal in linguistic circles, when the compilers of a new academic dictionary listed both versions of the word, only to be accused of ignorance. One of the most peculiar paradoxes of Russian-French culinary interaction is the word ‘bistro’. According to a legend, Russian soldiers, who entered Paris after defeating Napoleon, would often shout "bystro" (meaning “quickly”) to local restaurateurs when they wanted to be served quickly and the word stuck, growing to mean a small, informal restaurant. In the early 1990s, the word ‘bistro’ returned to Russia when a Russian fast food chain called Russian Bistrowas launched as an alternative to McDonald's, specializing in pies and pelmeni. Generally speaking, previously most culinary loan wordscame to the Russian language from French, whereas now they come mainly from English (in line with the overall tendency of Russian culture to lean towards the Anglo-Saxon world). And now a couple of words about drinks. In Soviet times, there was simply fruit juice, whereas now you are also offered a fresh (фрэш), meaning fresh juice. There used to be only two types of coffee: black (rarely available) and "with milk" (available everywhere, although it had little to do with real coffee). Now, nearly every café will invite you to choose between an espresso, a cappuccino, an Americano, a latte, and sometimes even a ristretto. The arrival of the first Russian cola drink was a truly landmark event. For many years, Pepsi-Cola enjoyed a monopoly on the Russian market, with its first ever plant in the Soviet Union built in Novorossiysk ahead of the 1980 Summer Olympics. Before then, this soft drink was seen by the Sovietsas a dangerous symbol of a hostile bourgeois culture. It was only in the 1990s, after the collapse of the Soviet Union, that Coca-Cola came on the Russian market too. In addition, numerous imitation drinks appeared, all of which hadthe word ‘cola’ in their names. In recent years, there has been an aggressive advertising campaign to replace imported soft drinks with their healthier domestic equivalents, primarily kvass, a fermented beverage made from rye bread. The advertising slogan for one brand of kvass, called Nikola, was based on a playful pun: "Kvass is no cola, drink Nikola!"